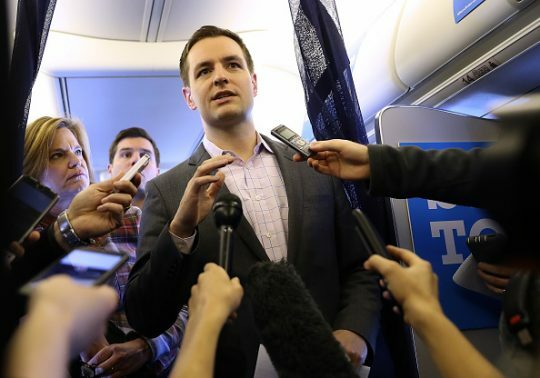 Robby Mook, who served as the campaign manager for Hillary Clinton's failed presidential campaign in 2016, will be the new president of the House Majority PAC, which works to maintain Democratic control in the House of Representatives. Mook will run the Democratic super PAC during the 2020 election cycle, the Hill reported Tuesday. During the 2018 cycle, the group spent more than $95 million to elect a new Democratic majority. Mook, a veteran Democratic operative, is taking over for Alixandria Lapp, who founded the super PAC in 2011 and will stay on as a senior adviser, the Hill reported. Mook, 39, has a long history with House Democrats. He ran the Democratic Congressional Campaign Committee's independent expenditure arm in the 2010 cycle, and he ran the entire committee in the 2012 election cycle. Later, he managed former Democratic National Committee chairman Terry McAuliffe's winning bid in 2013 to become governor of Virginia, before moving to Clinton's campaign. Since Clinton's loss, Mook has been a visiting fellow at the Harvard Institute of Politics and a CNN fellow. In December, the New York Times published a story in which the newspaper quoted Mook about the role of super PACs during the Democratic primary for president. "Every Democrat should approach the idea of a super PAC in the primary with caution," Mook said. "They are a liability as much as a strength." Super PACs have become a liability for Democrats, many of whom oppose the Supreme Court's landmark decision on Citizens United v. Federal Election Commission, which loosened campaign finance restrictions on unions and corporations. House Democrats like first-term Rep. Gil Cisneros (D., Calif.) have called on Congress to support campaign finance reform. However, Cisneros's campaign benefitted from Democratic super PACs, special interest groups, and tens of thousands of dollars from the financial services industry. The House Majority PAC, which is tied to House Speaker Nancy Pelosi (D., Calif.), spent $2,808,221 against Cisneros' Republican opponent, Young Kim. This entry was posted in Politics and tagged Hillary Clinton, House Democrats, Robby Mook, Super PACs. Bookmark the permalink.